Dehydration occurs when you lose more fluid through sweating, illness, fever or urination than you consume in food and water. Those most at risk are the elderly, people with chronic illnesses, children and athletes. Dehydration negatively affects organs and bodily functions, including the heart and cardiovascular system. Your body tracks circulatory system pressure through baroreceptors in the walls of major blood vessels in the chest and neck. Baroreceptors measure how much the vessel walls are stretching. If blood volume is too high, vessels are overtaxed; if volume is too low, vessels stretch minimally. If you are dehydrated, your blood volume decreases, so vessel walls do not stretch as much as they should. Baroreceptors relay this information to the brain, which boosts your heart rate to compensate for the reduced blood volume. It may seem counterintuitive, but dehydration can lead to increased blood pressure. Dehydration reduces blood volume, so your body compensates by retaining more sodium in the blood. High blood-sodium concentrations are related to high blood pressure and cause your body to close small blood vessels, the capillaries. As more capillaries close, the pressure in major blood vessels rises and overall blood pressure further increases. Because the blood has become more concentrated and thicker, it is more difficult to effectively circulate. Your body compensates by "squeezing" blood vessels to help move the blood along, which raises blood pressure. Cardiac output is the volume of blood that the heart pumps out per beat, multiplied by heart rate. For example, if your heart pumps 100 milliliters of blood per beat and your heart rate is 70 beats a minute, your normal cardiac output would be 7,000 milliliters a minute. Cardiac output represents how well the heart is delivering blood to the rest of the body. When you are dehydrated, your cardiac output decreases significantly. Even though heart rate is increased, the amount of blood that the heart can pump per beat is reduced because of overall low blood volume. For example, during dehydration your heart rate might be 90 beats a minute, but your heart might be pumping only 40 milliliters per beat. The total cardiac output, 3,600 milliliters per minute, indicates that your heart is much less efficient at providing blood to the rest of your body. Orthostatic hypotension occurs when blood pressure drops significantly when you quickly shift from lying down to sitting or standing. It can easily occur with dehydration; symptoms include dizziness, feeling light headed and fainting. During dehydration, orthostatic hypotension can occur because blood volume is too low for your body to adjust blood pressure and heart rate as it normally would when you change position. Blood pools in the legs, causing overall blood pressure to drop and symptoms to occur when you are in vertical positions. 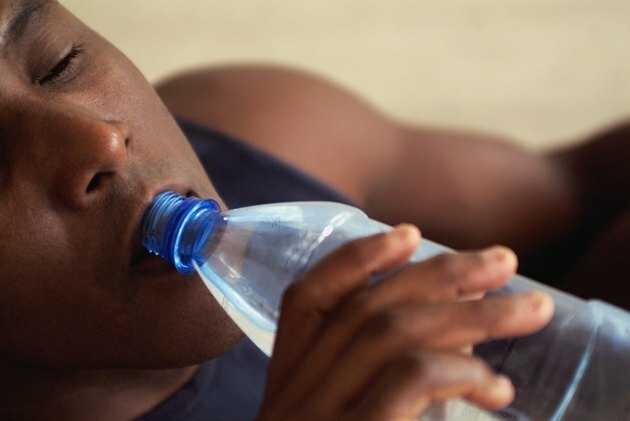 Point Health: What Are the Physiological Effects of Dehydration on Work and Sport Performance?